Experience Rumbazo! A family fun day including these activity stations and more! Come get your dance on with a special session of live Afro-Cuban music with visiting Rumbera, Carol Steel, and locals; Malamanya and Chini Perez. Visit Trinidad de Cuba in an experiential exhibit featuring art, culture, sounds of Cuba, an artist studio, and an artisan market without leaving Minneapolis. Learn about legal travel and USCAE sponsored tours to Cuba. Gallery Hours: Fri, June 24, 4pm - 8pm; Sat, June 25, 11am - 5pm. Private viewings available until July 9, email connect@uscubaartistexchange.org. Meet the Artist, Lázaro Niebla and Curator/Exhibit Designer, Mike Bishop while sipping La Canchanchara and eating la comida criolla (traditional Cuban home cooking) - like tostones (fried green plantains) and arroz con gris (rice cooked with black beans). USCAE, Festival LES VOIX HUMAINES, Fabrica de Arte Cubano and Oficina Leo Brouwer present A Night of Hip Hop at Havana's hottest art gallery, concert venue and social space. 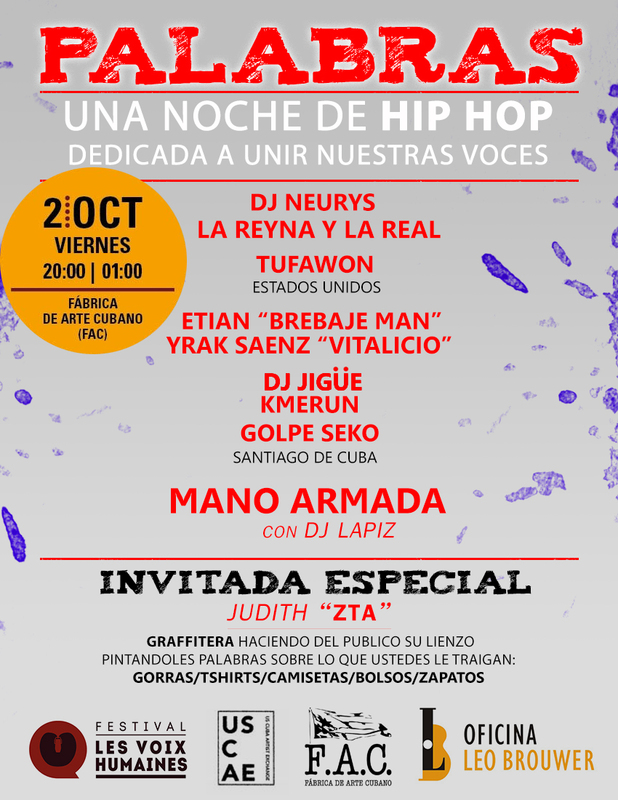 Two USCAE artists, Tufawon (Minneapolis) and Manny Phesto (Minneapolis) perform in a collaborative performance featuring hip hop artists from several different cities in Cuba and hosted by USCAE's cultural ambassador, Yrak Saenz "Vitalicio". *Partner Event* - A happy hour at the Du Nord Craft Spirits distillery to celebrate the exhibition of our documentary director's Cuba photo exhibition. An evening fundraiser of Cuban music, food, culture and art + special guest musician! An exclusive screening of part of the upcoming film. You will have a chance to give feedback and there will be a Q & A with director Paul Irmiter, and the Cuban artists. 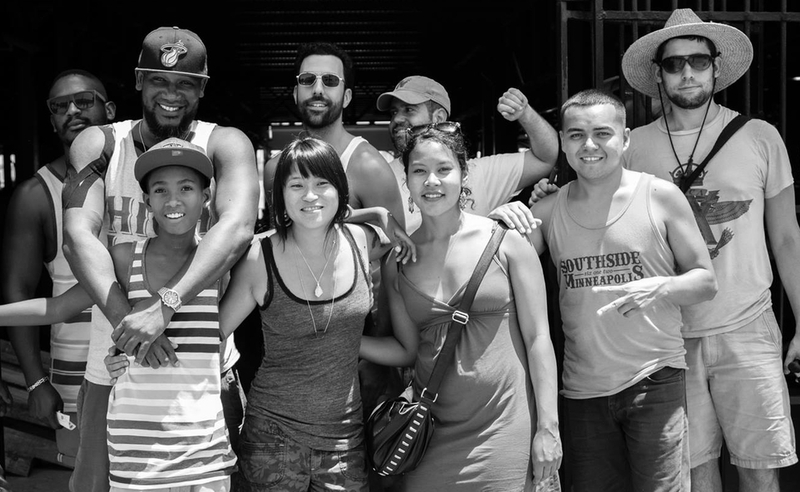 Learn more about US Cuba Artist Exchange’s programming and private tours to Cuba. In cooperation with Minneapolis Film Society and 612im. A FREE family focused event in Longfellow featuring US Cuba Artist Exchange and The Touch of Sound. An evening of live Cuban and Puerto Rican rhythms with Malamanya, Bomba Umoya and special guests. This high energy dance environment features traditional Cuban music such as “Rumba” and “Son” as well as traditional “Bomba” from Puerto Rico. Twin Cities Premiere Film Screening of "Shake The Dust"
*Partner Event* - A fundraiser event for ART of Diplomacy, an international organization that connects artists and launches collaborative projects for social change. 2 of our producing artists; Yrak Saenz & Yunior Rebollar, will speak on the panel at this event along with Toki Wright, Omaur Bliss and Douglas B. *Partner Event* - Come see our producing artist, Yrak Saenz, perform on the Festival of Nations stage at the MN State Fair. He'll be inviting some friends for four, 30 minute sets of Cuban hip-hop and fusion. Set times are; 12pm, 1:30pm, 3pm and 4:30pm. Join us on May 15th, 2015 at Scenergy Events in South Minneapolis for a documentary short by USCAE participating artist Paul Irmiter. This documentary short is preview to the release of "Closer Than You Think" a full length documentary that will be released later this year. The screening will begin at 7pm. This past August our friends Jesse A. Marks, Jonah Marks, Truely Squires, Sarah White, Tony Schreiner, Mariesa Harmony, and Rafael Gonzales traveled to Cuba for 10 days through the US Cuba Artist Exchange! On October 29th we celebrated, reminisced, played music, danced and shared photos/videos/sounds from our tour to Cuba. During the June tour to Minneapolis. MN visiting artists Valenti, Camilo Diaz de Villalvilla, and Adrian Rumbaut exhibited their work at Scenery Events in South Minneapolis. During the run of the exhibition the artist also lead workshops that highlighted their process and how they create. During the June tour to Minneapolis the US Cuba Artist Exchange hosted Intercambio at Ice House in Minneapolis. Intercambio was a night of collaborative performances featuring an eclectic lineup of artists from Cuba and Minnesota. Intercambio showcased the wide array of music styles ranging from traditional Afro Caribbean sounds to contemporary Hip Hop. There were performance by Nelson Valdes Viera (Cienfuegos, Cuba), Yrak Saenz (Havana, Cuba), I Self Devine (Minneapolis, MN), Sarah White (Minneapolis, MN), Bomba Umoya (Minneapolis, MN), Walter Chancellor Jr. (Minneapolis, MN), Tufawon (Minneapolis, MN), DJ Don Cuco (Minneapolis, MN), and Rambo Salinas (Minneapolis, MN).